Japanese officials have blown up a rocket carrying two spy satellites intended to monitor North Korea. Officials at the Japanese space programme said the rocket had to be destroyed after take-off because of an unspecified technical failure. It was impossible to save the satellites, the officials added. An investigation is underway. The original launch had been scheduled for September, but was postponed three times because of technical problems. "Shortly after the launch, we sent a destroy order to the rocket as we concluded that the mission cannot fulfil the purpose," said spokesperson Shoko Yamamoto. "We cannot tell further details, but at least we can say this mission ended in failure." Japan already has two satellites monitoring North Korea, which is suspected of developing nuclear weapons. The BBC's Jonathan Head in Tokyo says the incident is an embarrassing setback for Japan, just weeks after China - a technologically less advanced country - put a man into space. 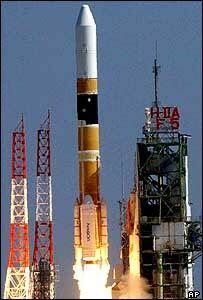 Our correspondent says the Japanese are bound to try again to launch spy satellites. North Korea has denounced the deployment of the first two satellites as a "hostile act" that could trigger a renewed arms race. The satellite project was intended predominantly as a response to North Korea's firing of a ballistic missile over Japan into the Pacific in August 1998. Until then Japan bought commercial satellite photos from the US and France. The launch came at a sensitive time for Japan and North Korea as the two countries prepared to sit down at six-way talks to resolve the crisis over Pyongyang's nuclear ambitions. Some 400 police were around the launch site on the southern island of Tanegashima. Coast guard ships were patrolling waters to thwart possible terrorist attacks or a possible attempt by North Korea to disrupt the launch. "It's the prospects of North Korea's nuclear and missile programmes that alarms Japan"